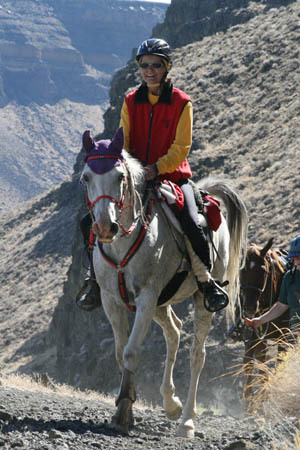 The way for an endurance rider to really see what goes on in an endurance ride is to ride one and to work one. Today Connie and I worked the ride. Day Two was a 60 mile out-and-back loop to the Snake River and the Petroglyphs. Perfect day for it, chilly in the morning again and 70's in the afternoon - though it felt a lot warmer down in the canyon. 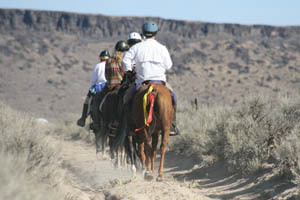 The vet check was set up out on a bluff above the Snake River 20 miles out, and the same one was used on the way back. The morning began with a cup or two of coffee, which resulted in mad scrambling to get the trucks and trailers loaded in time to get on the road to meet the first riders coming into the first vet check. Well, the vets were on time, but the rest of us lingered a little too long over our coffees. The riders were off at 7:30 AM, or 7:45 AM - not too many people are in a hot-shoe hurry - and we were off in our vehicles more or less at 8 AM. Steph and I and Girlie the Cowdog, in the truck pulling the horse trailer, were leading Connie in her truck, who was leading Paul and the portapotties... and we lost Paul. Since only Steph really knew where the vet check was, we pulled over and waited for Paul, and waited. Finally, having visions of overturned portapotties on Bates Creek Road, Steph sent Connie back to look for him, saying we'd flag the road turns with ribbons for her. We drove on, hearing some kind of loud Bang off the back of the truck and seeing a big puff of dust, which we stopped to look for something that had fallen off the truck, then saw the portapotties cutting cross-country on a dirt road, which meant that Connie wouldn't have found them at all. (She drove all the way back to the house, and not finding them, just had another cup of coffee, then found her way out to the vet check). Later in the day, we lost Zico's dog bed off the back of Connie's truck. We were sure all of this had something to do with the lingering effects of the full moon. A couple of riders got pulled at the 20-mile check, and a few more at the return 40-mile check. 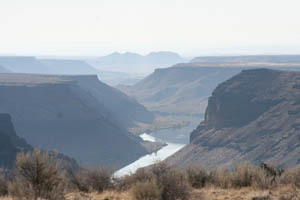 It's a long climb down to the Snake River, and a long climb back out on a hard and rocky road. Lameness and a few metabolic incidents took their tolls on a few horses. Nevertheless, I heard no complaints about the weather or the fantastic scenery or the trail. Happiest horse of the day appeared to be Frank, Tom Noll's horse. I asked Tom at dinner (parmesan chicken and a special potato dish!) how Frank was doing. Tom shook his head. "Ya know? He's just a monster. He got a chiropractic adjustment, and he's gotten two adequan shots, (Frank is 19 now) and it's added 5 years to his life. I don't know if that's a good thing or a bad thing!" 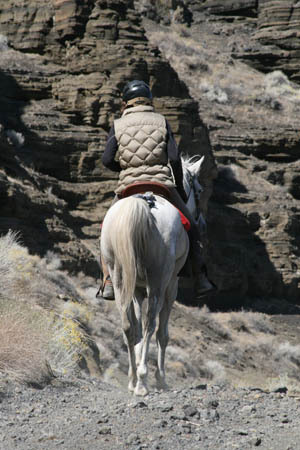 24 horses and riders finished Day Two, with Nance Worman and Tom Noll still in the running for the Owyhee Totally Tough Sucker award.